I recently changed my mobile phone, partly because the battery on my old phone was not holding its charge for long, but mainly because I wanted something with more features and particularly with a better camera. When I am out for the purpose of taking photos, I am more than happy with my Canon EOS 80D, but I wanted something smaller and more portable for those instances where you come across a photo opportunity but do not have your camera with you. I researched phones online and taking into account that I wanted an Android phone, that was available from my existing suppliers, was reasonably priced and was available as an upgrade on my existing plan, the outstanding candidate came out as the Samsung Galaxy S9 plus. For a full and detailed review of this phone visit Techradar whose verdict states "You won't find a bigger and better Android phone than the Samsung Galaxy S9 Plus, thanks to its oversized 6.2-inch curved screen and low-light-defeating dual-lens camera." Their review goes into far more detail than I possibly could, so I will just show a selection of images that I have taken since obtaining the phone. 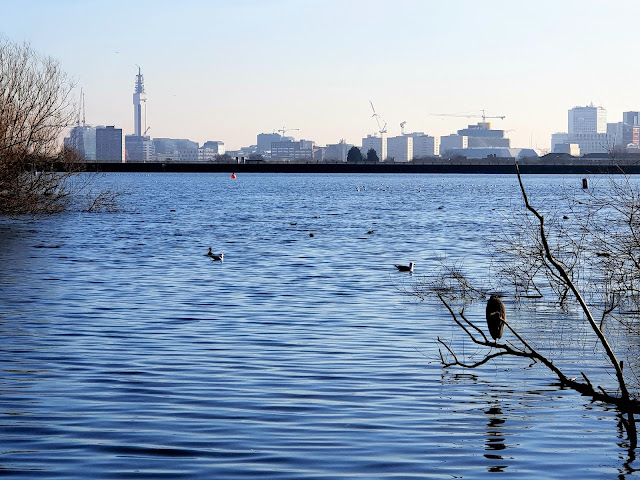 I will start at Edgbaston Reservoir in Birmingham. 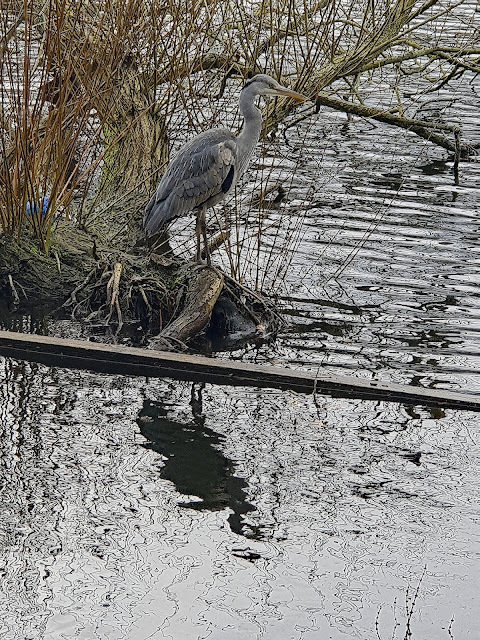 Although it is only about a mile from where I live and about one and a half miles from the city centre, it is full of wild birds, including herons, swans, coots, moorhens and countless gulls. I walk round there a couple of times a week with friends (it is a 1.75 mile walk) and having the new phone means I can stop for a few seconds to take a photograph, without having to carry around a DSLR camera. The view towards the dam on a hazy morning. Two of my favourite birds to be found on the reservoir. I also found the phone very useful on a trip down to London. 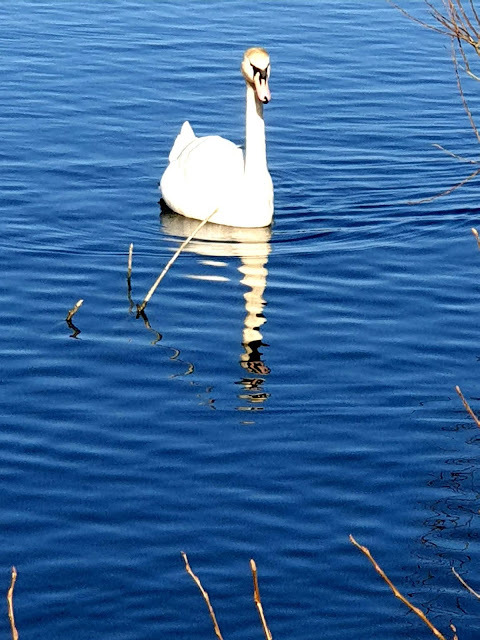 Again, photography was not the purpose of the visit, so I did not take the camera, but I am pleased with the results of the following shots taken with the phone. Parakeets seen in the neighbours garden in Wandsworth, London. 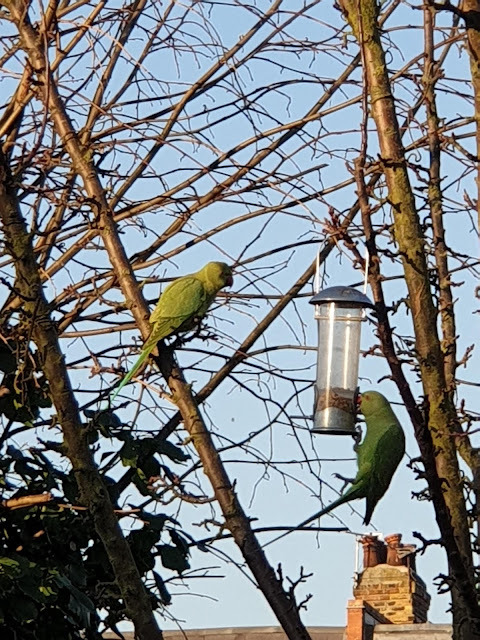 The parakeets that are now well established in London and the Home Counties consists of rose-ringed parakeets (Psittacula krameri), a non-migratory species of bird that is native to Africa and the Indian Subcontinent. The origins of these birds are subject to speculation, but they are generally thought to have bred from birds that escaped from captivity. 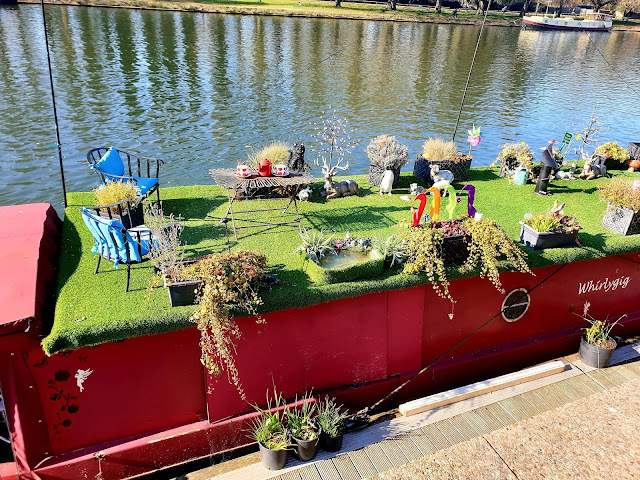 One morning we drove out to Kingston upon Thames where I couldn't resist this image of a garden on the roof of a houseboat moored in the Thames. 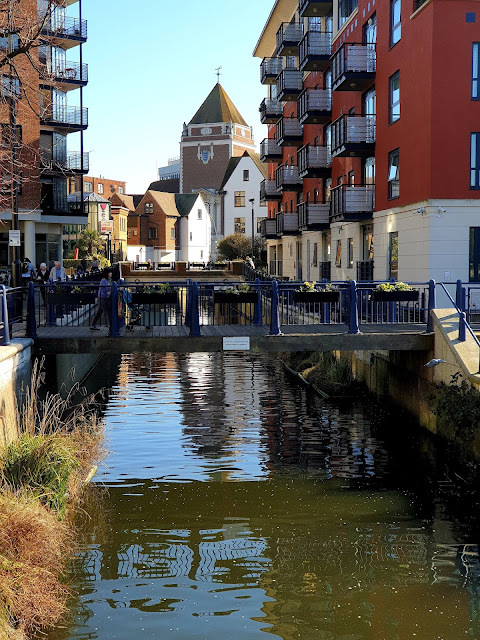 Not far from this, the Hogsmill River feeds into the Thames and it is designated as a Waterfowl Conservation site. So we come to the last Caribbean island of our cruise, Saint Martin, if you on the French half, or Sint Maarten on the Dutch half. 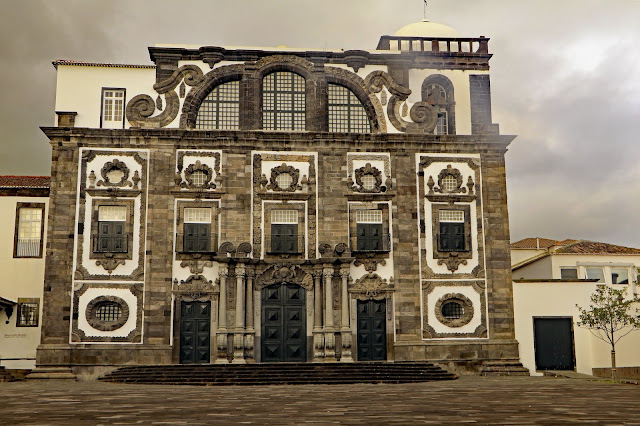 We landed at Philipsburg, the capital of the Dutch half and the largest town in the island, with a population of around 40,000. There we 6 cruise ships in port the day we were there, putting the population up by about 50%!! 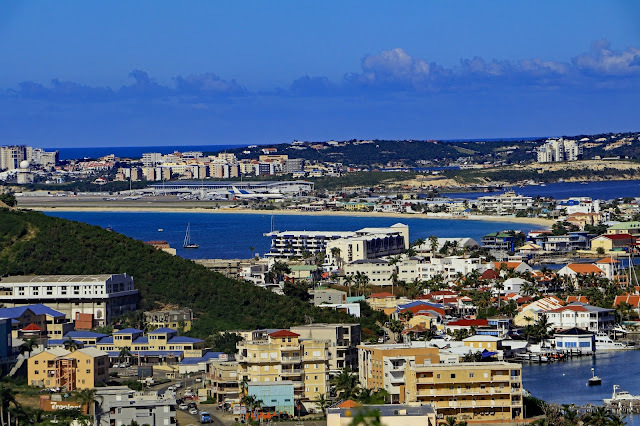 We took a taxi for a drive around the island, and the following image is from just outside Philipsburg, looking across the island and the airport, which can be seen in the centre of the image, with a plane on the runway. Simpsons Bay Lagoon can be seen in the lower right corner, and again above it to the right of the airstrip with Simpsons Bay in front of the airstrip. 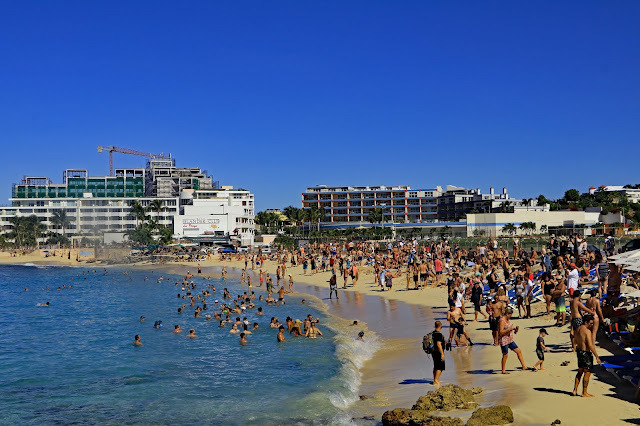 Maho Beach in St Maarten famous for being adjacent to the Princess Juliana International Airport, and is a popular site for tourists and plane watchers. As you may see, many people are looking inland, because the fence at the back of the beach is actually, the end of the runway! 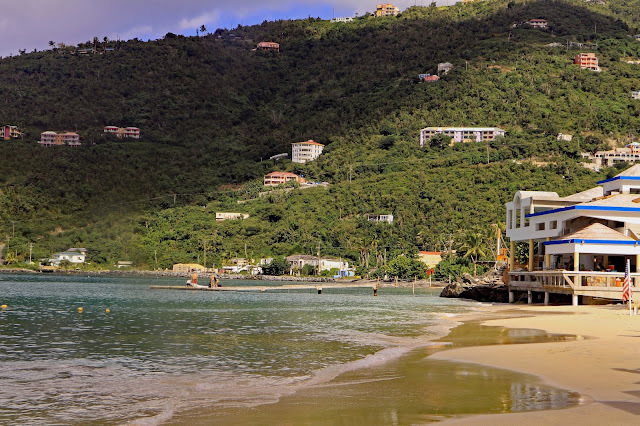 Leaving Maho Beach, we took the short journey to Marigot, the capital of French Saint Martin. Fort St Louis overlooking the marina in Marigot. The fort was commissioned by royal governor Jean Sebastian de Durat, and was built in 1789 on a hill overlooking Marigot Bay to defend the harbor warehouses where expensive exports were kept, mainly coffee, sugar cane, rum, and salt, particularly from the English who frequently sailed over from Anguilla! We couldn't leave the Caribbean without one more visit to a beach! 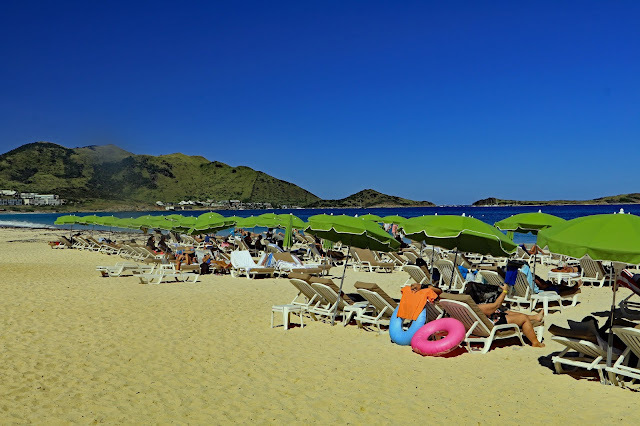 Orient Bay beach on St Martin, with sun loungers and umbrellas on golden sand with a clear blue sea and blue sky. Orient Bay is a coastal community and beach on the French side of the island. Until 1985 the area was undeveloped. Damage caused by Hurricane Luis in 1995 was quickly repaired but it was again hit by Hurricane Irma in 2017 and is again being redeveloped and remains one of the most popular beaches on the island. 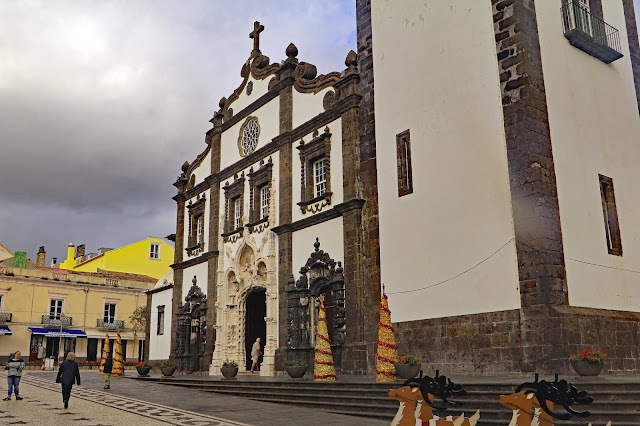 We finally left the Caribbean, to head back home, calling at Ponta Delgada in the Azores after seven days at sea. 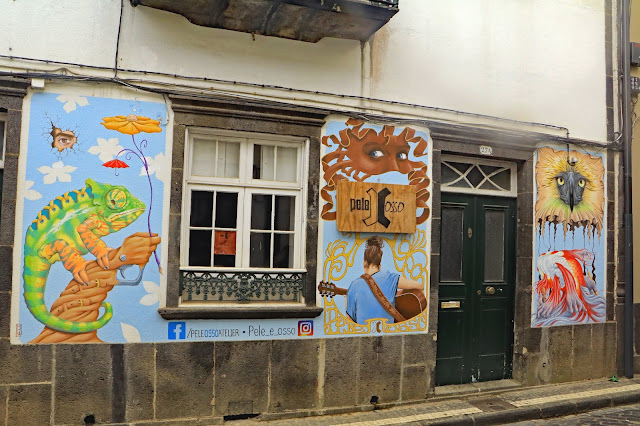 Look out for my final post on this picturesque town. 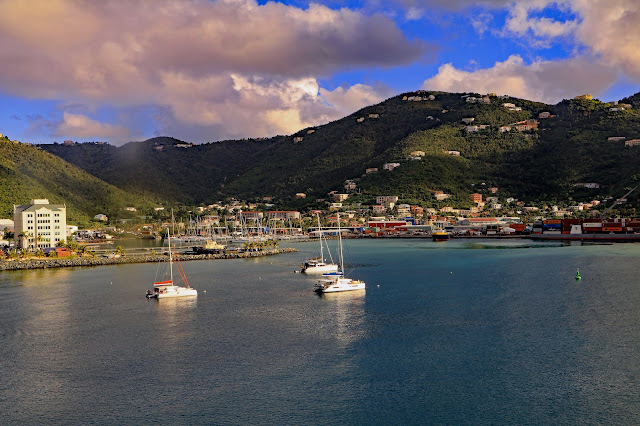 Our penultimate stop on our Caribbean Cruise was Road Town, the capital of Tortola in the British Virgin Islands. With five very full days behind us, we decided to make this a day of rest! 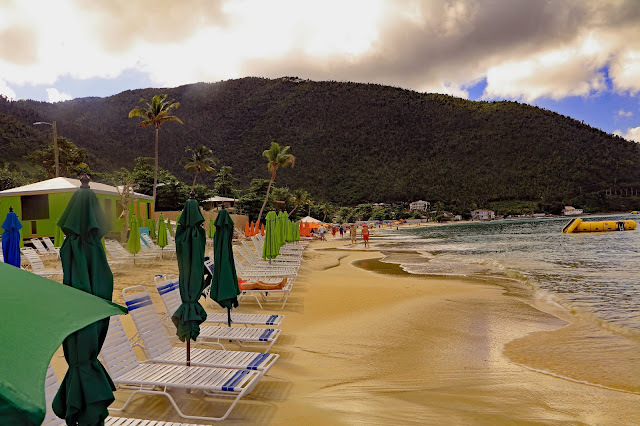 We travelled out to Cane Garden Bay, on the north shore of Tortola, about 5 miles west of Road Town, where we spent most of our day in a deck chair on the beach, with the occasional dip in the warm waters of the Caribbean. As may be seen from the two images above, the beach was quiet with plenty of choice of deckchairs and umbrellas and the sea was calm, and warm. There were a few bars and restaurants around, which was a surprise to some visitors, showing how quickly the area bounced back after Hurricane Irma last year (2017). Returning to the harbour, we had this view of Road Town and its harbour. The Inner Harbour and Marina are to the left. 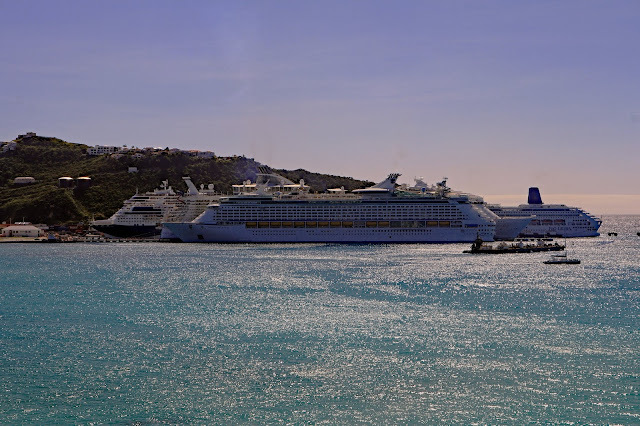 Viewing the town from the cruise ship pier, showing the horseshoe-shaped Road Harbour, as we set sail for our final Caribbean island, St Maarten. 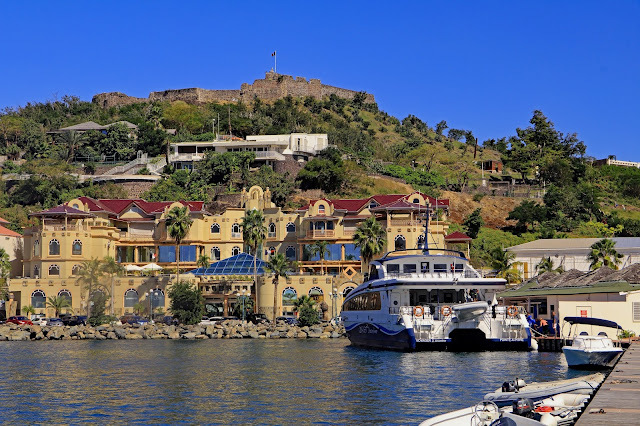 It is half French and half Dutch and is said to be one of the Caribbean's most diverse and interesting islands! Look out for my next post to see if you agree! Here we are on our fifth Caribbean island, Antigua, with just two more to go! My favourite part of our visit was when we went up to Shirley Heights, which offers the best view on the island, and arguably in the Caribbean. This military complex, within a short distance of the Dockyard, is named after Sir Thomas Shirley, Governor of the Leeward Islands, who strengthened Antigua’s defences in 1781. Britain had lost all her West Indian colonies (including North America) at this time except Antigua and Barbados. 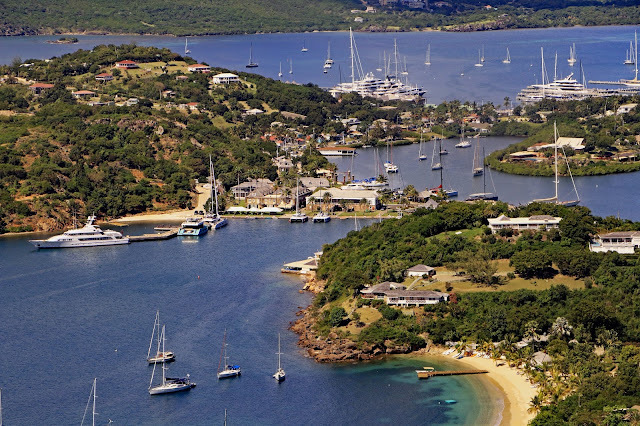 Much effort, therefore, was put into Antigua’s defences, mainly because of the island’s great sugar producing value and the important Dockyard. 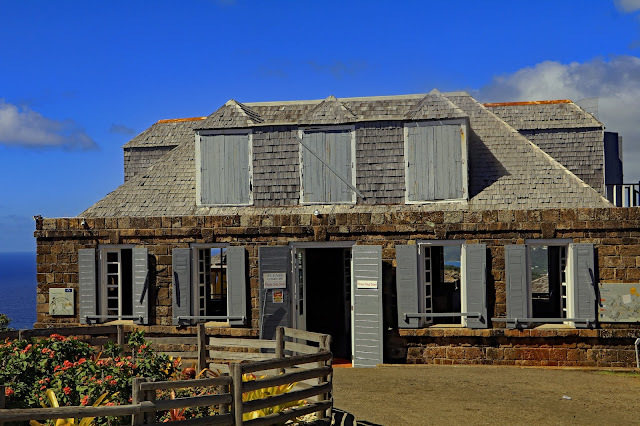 The guard house built in 1791, is one of the few buildings that have been restored at Shirley Heights. Walking through the Guardhouse you will come to the terrace which affords a superb view to the west, of English and Falmouth Harbours. 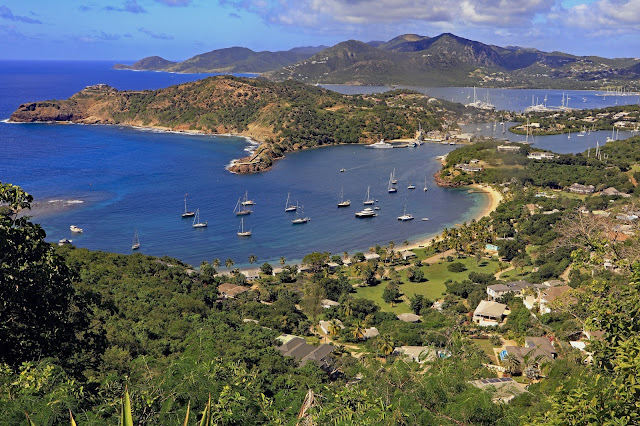 A superb view of English and Falmouth Harbours, considered the best view in Antigua. View of English Harbour. Freemans Bay is in the foreground, and Falmouth Harbour in the background, with Nelsons Dockyard in the centre. Looking to the east is the spectacular headland of Standfast Point, which is owned by Eric Clapton. After leaving Shirley Heights we travelled down to Nelsons Dockyard. Clarence House, part of Nelsons Dockyard. 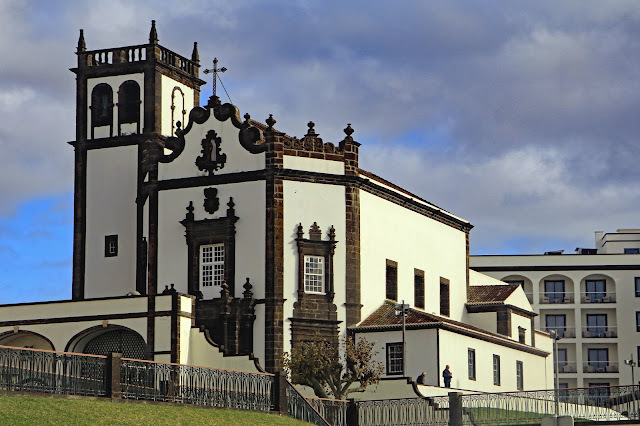 Located on a low hill overlooking the Dockyard it was built by English stonemasons to act as living quarters for Prince William Henry, (the future king, William IV), who stayed here when he was in command of the Pegasus in 1787. 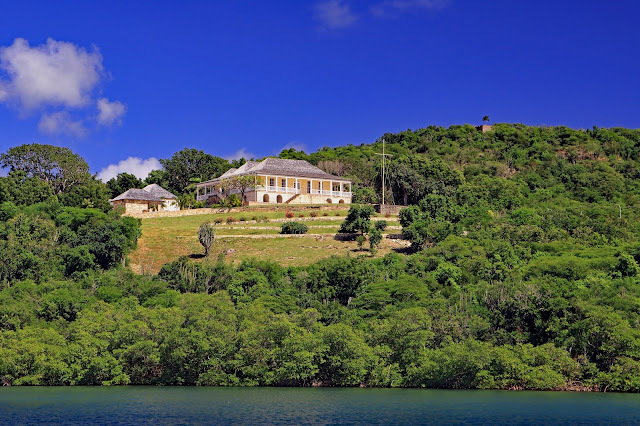 At present it's the country home of the Governor of Antigua and Barbuda. After spending a couple of hours on the beach we returned to our ship and prepared for the following day in Tortolla! 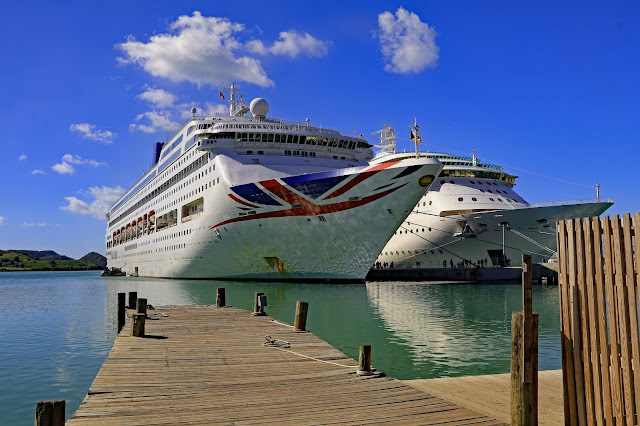 The Oriana alongside Oceania's Sirena at the St Johns cruise ship terminal. 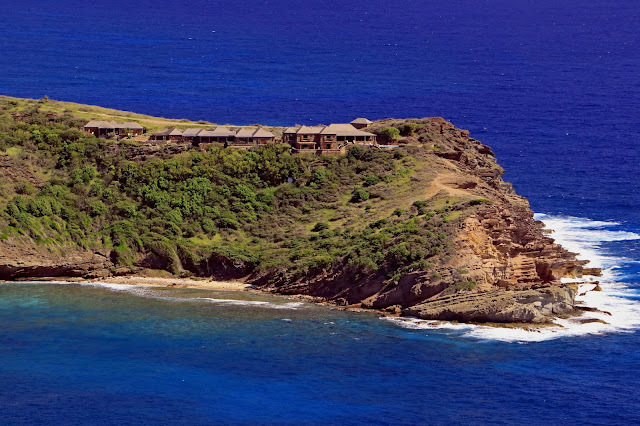 The fourth island we visited on our cruise was St. Kitts, the classic Caribbean island with a mixture of deserted beaches, sleepy villages, lush rainforests and sugarcane fields and a mini mountain range with a dormant volcano in its midst. Along with the island of Nevis, it is also known as the Federation of Saint Christopher and Nevis. 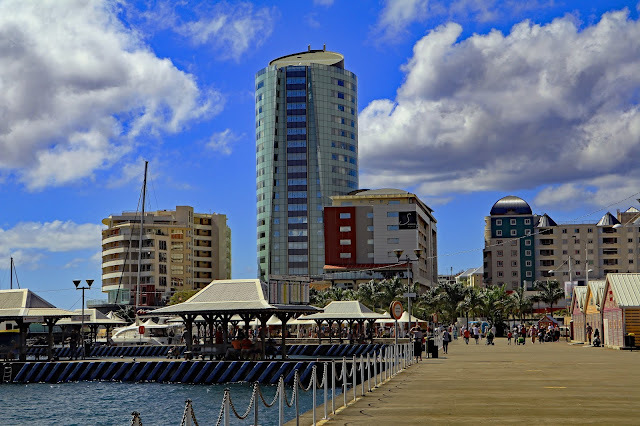 It is a country located in the Leeward Islands chain of the Lesser Antilles, and is the smallest sovereign state in the Western Hemisphere, in both area and population, and is a member of the British Commonwealth. 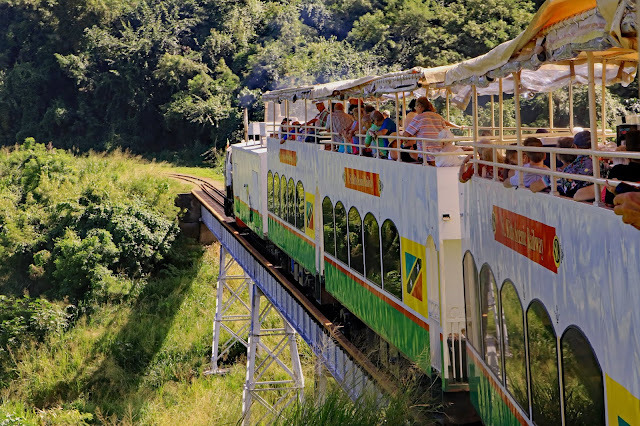 We began our visit by taking a trip on the St Kitts Scenic Railway. 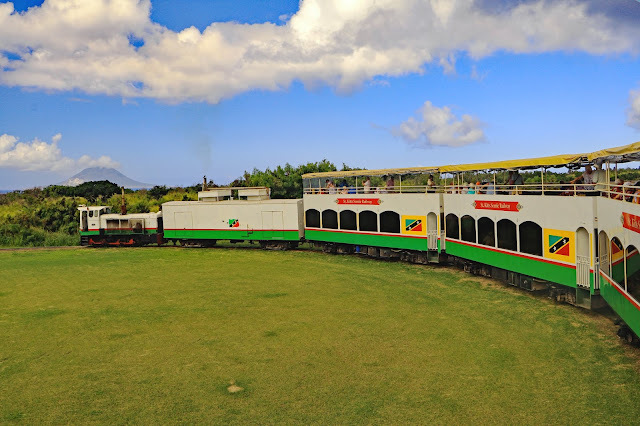 The St Kitts Scenic Railway is a narrow guage railway, which was built between 1912 and 1926 to transport sugar cane from the island’s sugar plantations to the sugar factory in the capital city of Basseterre, today the “Last Railway in the West Indies” provides visitors an unsurpassed opportunity to experience the scenery and culture of this unspoiled country. 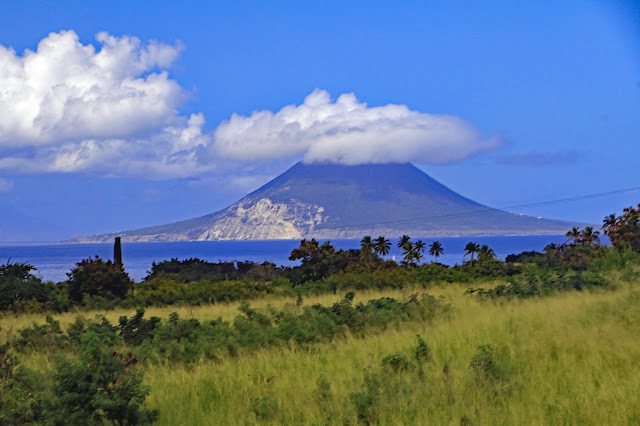 In a short while we came across this magnificent view of the cloud topped island of Nevis. 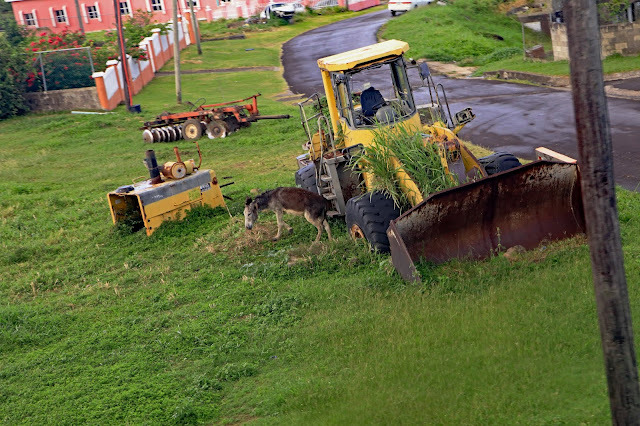 Although St Kitts is undoubtedly a beautiful island, the government are having a problem with abandoned vehicles. There doesn't appear to be any scrap metal industry so when a vehicle has reached the end of its useful life, it is just abandoned either by the side of the road, in a field or anywhere else the owner can find. In this exammple the tractor appears to have been abandoned on the verge of the roadside. Weeds are growing up through the centre of the vehicle, while a stray donkey chews the grass. A few minutes later we leave the village and head into the countryside, crossing a steel bridge over a canyon. The image shows the unique double decker coaches with an upper open–air observation platform and the train travelling through the lush vegetation of the island. The next two images show examples of the lovely bays and deep blue sea to be found on the island. 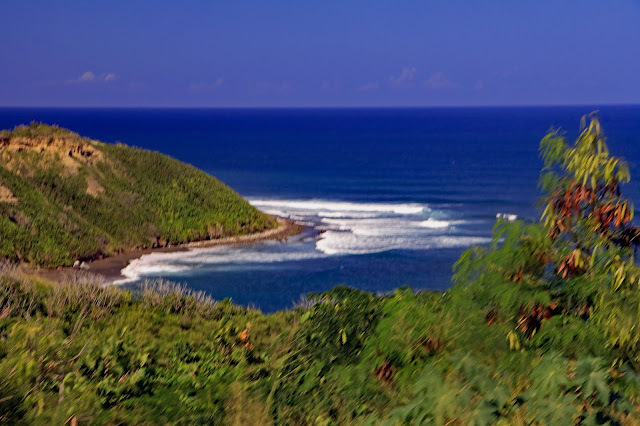 One of the many bays on the island of St Kitts viewed from the train, showing deep blue sea, crashing waves onto the beach and a cloud free blue sky. 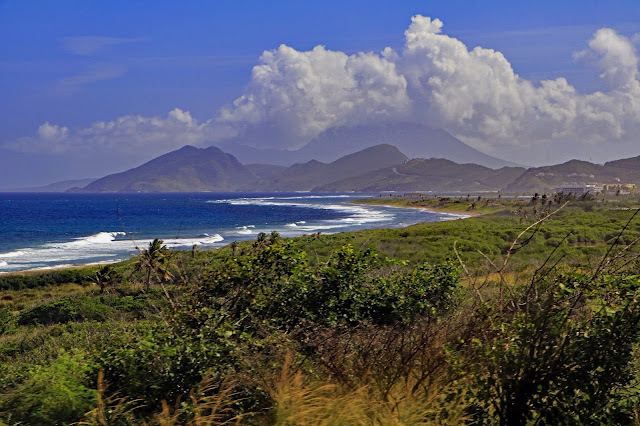 View of St Kitts showing the vegetation, blue sea, rolling waves, sandy bays and mountains with a cloud topped Mount Liamuiga, the highest point on the island of Saint Kitts, as well as one of the tallest peaks in the eastern Caribbean archipelago. 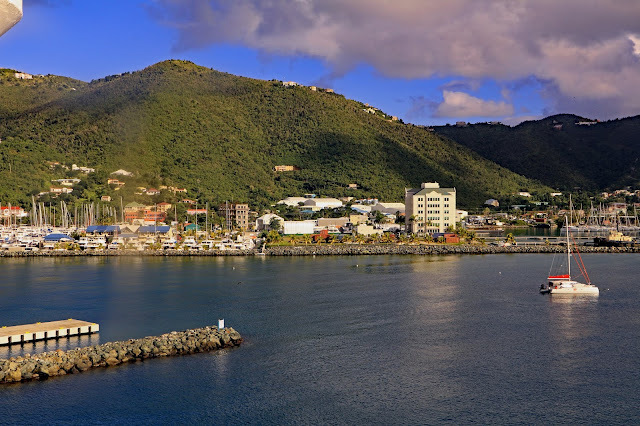 After our railway journey, we spent a few hours walking around the capital of the island, Basseterre. 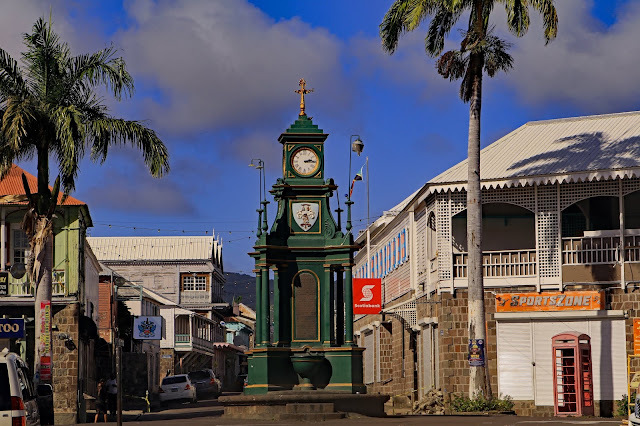 Basseterre is a very small town, laid out in a grid pattern. It has four main streets running west to east, and a main street running north to south. 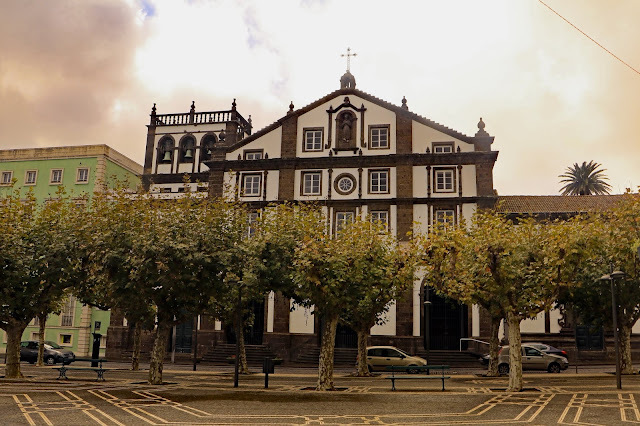 The city has 2 centres, at The Circus, which is geared towards tourism, and the Independence Square, which contains the cathedral, courthouse, and most of the older buildings. The Berkeley Memorial is in the form of a clock and drinking fountain and stands in what is known as the ‘Circus’, named after Piccadilly Circus, London. It is an ornate, cast iron tower with four clock faces and more than a little architectural decoration and was built in Glasgow, Scotland. There are four clock faces, each one facing one of the four streets leading to the Circus. It was built in honour of Thomas B.H. Berkeley, a former president of the General Legislative Council in the 1880s. 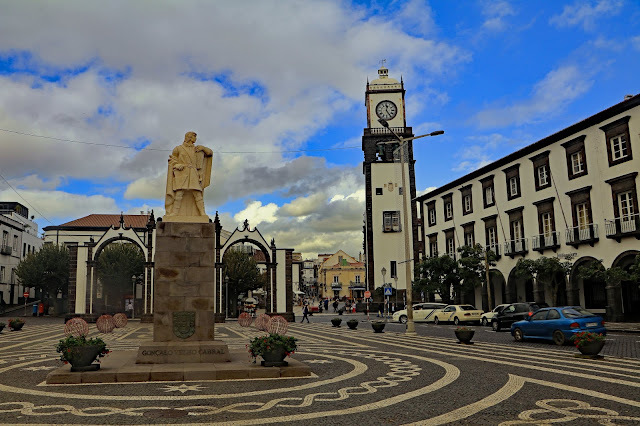 Independence Park was developed in the 1730's as a market place and is centrally located by the Cathedral, the Circus area and the Port Zante shopping complex in Brasseterre. 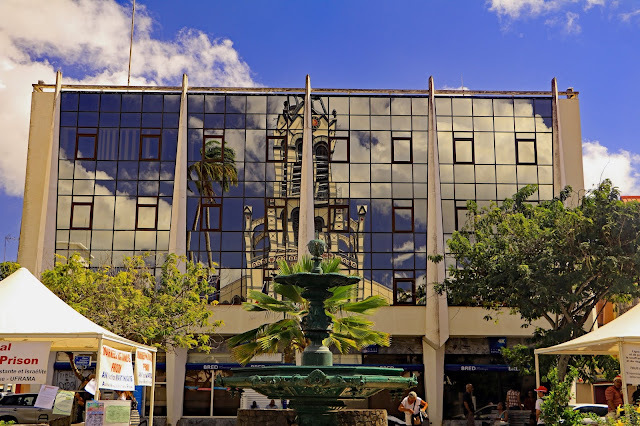 Formerly the site of a slave market, the square was renamed "Independence Square" when St. Kitts & Nevis gained political Independence from Britain on 19th September 1983. 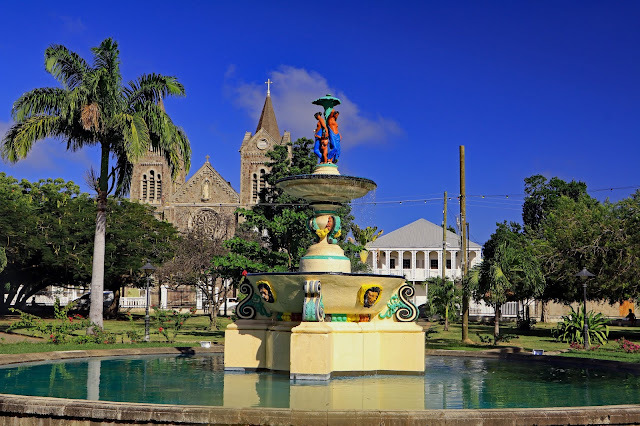 The stone fountain in the centre commemorates the introduction of piped water to Basseterre in the 1800's. The figurines at the top of the fountain are decorative nymphs. Look out for my next post, the island of Antigua, which boasts of having over 365 beaches - one for every day of the year! 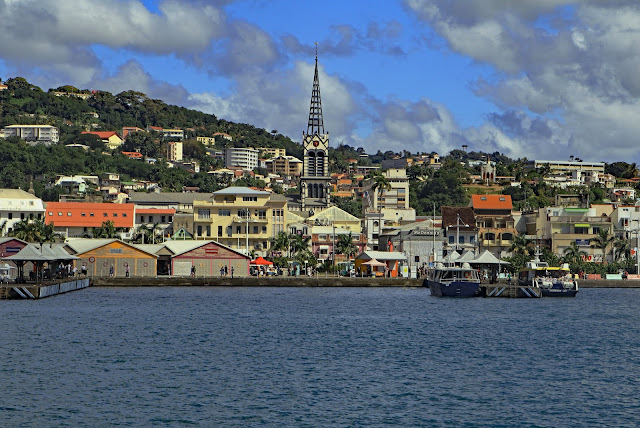 Following our day in St Lucia our next destination was the French Island of Martinique, and its administrive capital of Fort de France. The Cathedral of St Louis dominates the skyline and that is where we headed after disembarkation. 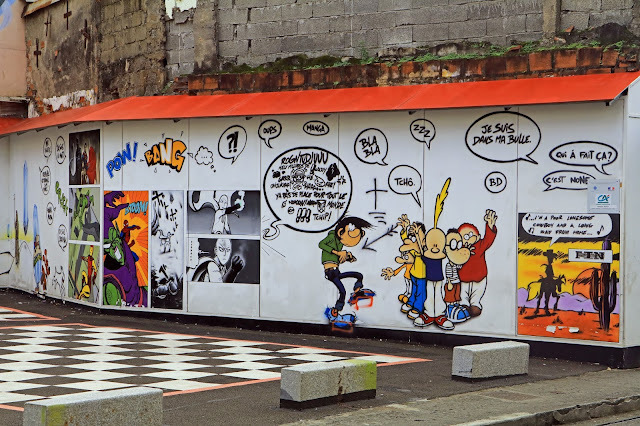 On the way we walked along a side street and came upon this attractive piece of graffiti. A few minutes later we arrived at a side entrance in the cathedral and went inside. 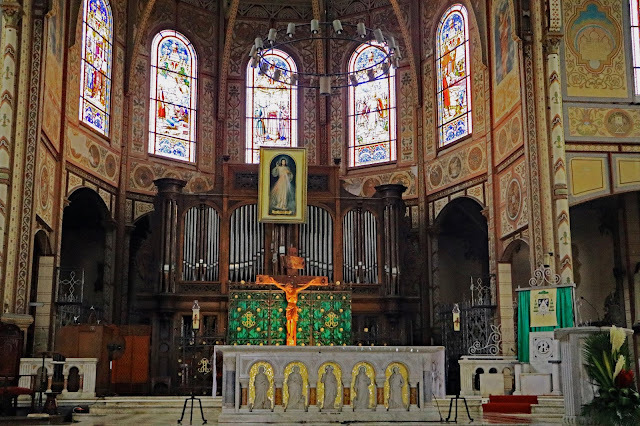 Note the marble altar and the grand pipe organ as well as the beautiful stained glass windows. After a good look around, we viewed the cathedral from the outside. 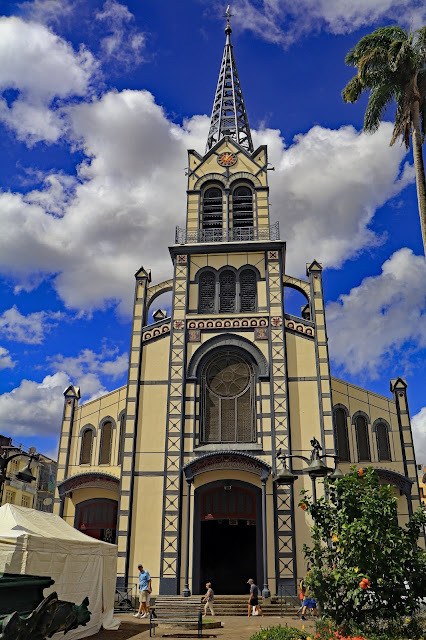 The Cathedral, which was designed by the architect Henri Picq, and its 58m-high spire have stood on Rue Victor-Shoelcher since 1895. This metallic structure, the sixth to be built on this site, was designed to withstand natural catastrophes, thanks in particular to the materials used (reinforced concrete and cast iron). The cathedral fronts on to the Place Mgr Roméro and on the opposite side of the square is a glass fronted building and as regular readers will know, I cannot resist a good reflection! Allthough most of the town is full of traditional buildings, there is a very modern development on the waterfron by the cruise ship terminal. 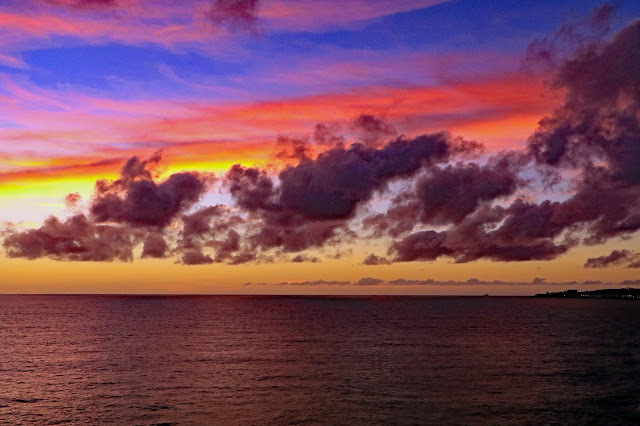 Look out for my post on our next port of call, the classic Caribbean island of St Kitts.